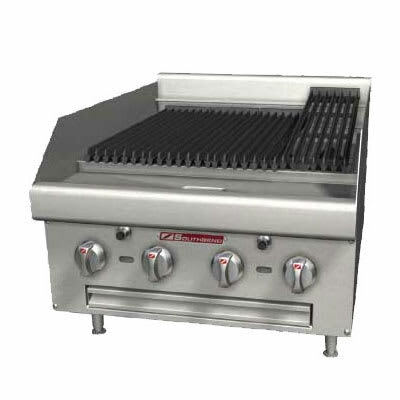 The Southbend HDC-48 gas charbroiler has eight stainless steel burners spaced every 6 inches for even heating. They are controlled independently, so different products can be prepared at the same time on the cooking surface, and the grid can be positioned two ways and flipped over to cook on the other side. Rear and side splashes contain liquids and crumbs to the cooking surface. For heavy, constant use, the sides are reinforced and insulated, and the exterior sides and front are made of strong stainless steel to simplify cleaning. Four 4-inch adjustable legs elevate the Southbend HDC-48 gas charbroiler off the countertop, while leveling the unit on most uneven surfaces. To learn more about charbroilers and other countertop equipment, check out our countertop cooking equipment buyers' guide.